Steps from the chairlifts and worlds away from lifes everyday stress the Lodge Tower in Vail is the premier choice for slopeside getaway in North Americas finest ski and summer resort. From single hotel rooms to spacious three-bedroom condominiums the Lodge Tower offers a generous range of luxurious mountainside accommodations for families couples groups or individuals. Our uniquely appointed condominiums offer a variety of bedding options to meet the needs of any family and our hotel rooms are perfect for couples. Condos feature large full kitchens balconies with expansive views of the mountain or the village and spacious great rooms with dining areas and authentic wood-burning fireplaces. Lodge Tower is snug against the base of Vail Mountain just 75 yards away from the Vista Bahn Chairlift. Our front door opens to the gentle bustle of Vail Village with its pedestrian streets and charming Bavarian architecture. All the shops and restaurants of Vail Village are within just a short walk. Theres simply no better location in Vail. 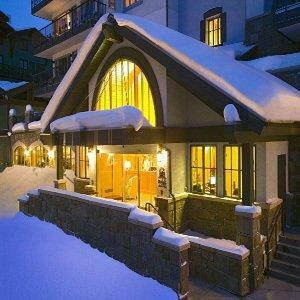 the Lodge Tower in Vail is the premier choice for slopeside getaway in North Americas finest ski and summer resort. America's Favorite Cannibal is immortalized by meat dishes -- and a marble bust -- at the Alferd Packer Memorial Grill. Features a real gas chamber, cell dioramas, and artifacts of penal life.